A new test developed by Yale School of Medicine researchers, that measures biomarkers common to many viruses via cellular RNA and protein obtained from a nasal swab, has been shown to accurately identify viral infection as a cause of respiratory symptoms. Should such a test be commercially developed and widely used in physicians’ offices, it could help reduce the misuse of antibiotics to treat viral infections. 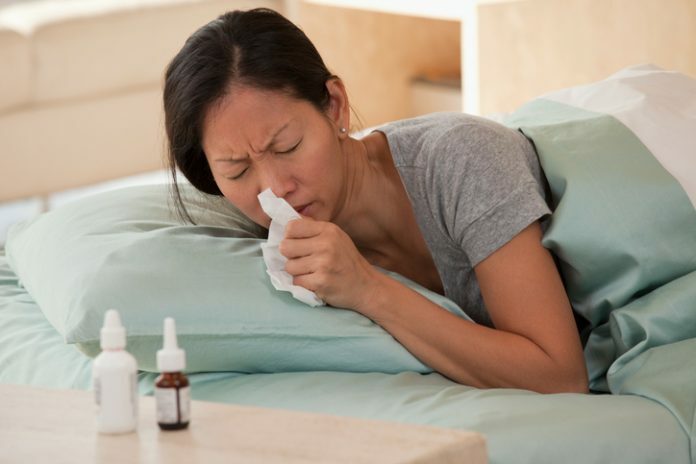 And should it be used to evaluate samples from nasal swabs, as it has already been used in experimental tests that evaluated upper respiratory infections, it could be particularly helpful in evaluating very sick patients or young children. The new test was developed by Yale School of Medicine researchers, Marie L. Landry, M.D., and Ellen Foxman, M.D., Ph.D. According to Foxman, an assistant professor of laboratory medicine, it is a simpler and more cost-effective way of looking at viral infection. To identify biomarkers of viral infection applicable to many different respiratory viruses, Foxman and Landry first tested human nasal cells in the laboratory. Using genetic sequencing techniques, they screened the cells for RNAs and proteins that increase when a virus is present. Foxman and Landry identified three RNAs and two proteins that are “turned on” by a virus. Guided by these findings, the researchers conducted two studies. One study prospectively examined the performance of a signature of three host mRNAs for predicting viral infection. The other study prospectively evaluated the CXCL10 and CXCL11 proteins. Like the RNA markers, these proteins are known to be associated with the antiviral interferon response. The results of this work appeared December 21 in The Journal of Infectious Diseases, in an article entitled, “Antiviral Response in the Nasopharynx Identifies Patients with Respiratory Virus Infection.” According to this study, the new test indicates great potential for developing simple, pan-viral tests to identify patients with respiratory virus infection. The researchers hope to develop their new method into a rapid gene or protein test that doctors could perform in their offices. Such a test could help providers diagnose a viral infection more quickly and accurately than with routine evaluation or more time-consuming and expensive tests, the researchers said. Foxman noted that the research team's goal is to create a gene- or protein-based test available for general use within one to five years.